Research by the IBM Institute for Business Value presents a detailed look at the analytics best practices by leaders in the mid-market. Mid-market companies are realizing decision making benefits from data, but lag behind larger enterprises when it comes to big data and advanced analytics use. 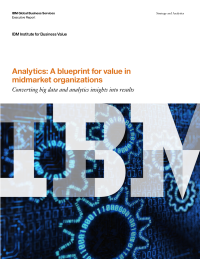 Based on research by the IBM Institute for Business Value, “Analytics: A blueprint for value in midmarket organizations” takes a detailed look at the analytics best practices of midmarket leaders. Download this insightful executive report today.